When we hear the phrase "dressing for your age," we can't help but bristle a little. The idea that women should or shouldn't wear certain items because of how many years they've been alive is a rather old-fashioned one, and one we'd like to subvert by giving the power back to the ladies. To do that, instead of concocting a list of arbitrary tricks, tips, and guidelines for what to wear after the age of 30, 40, 50, and so on, we're putting the onus back on you, the women who make these choices. We chatted with 12 real women, many of whom have reached a certain age, and got them to open up to us about when in their lives they retired certain fashion items. From short skirts to halter tops, find out when these amazing women said goodbye to the pieces they once loved. Keep scrolling to read their honest thoughts! 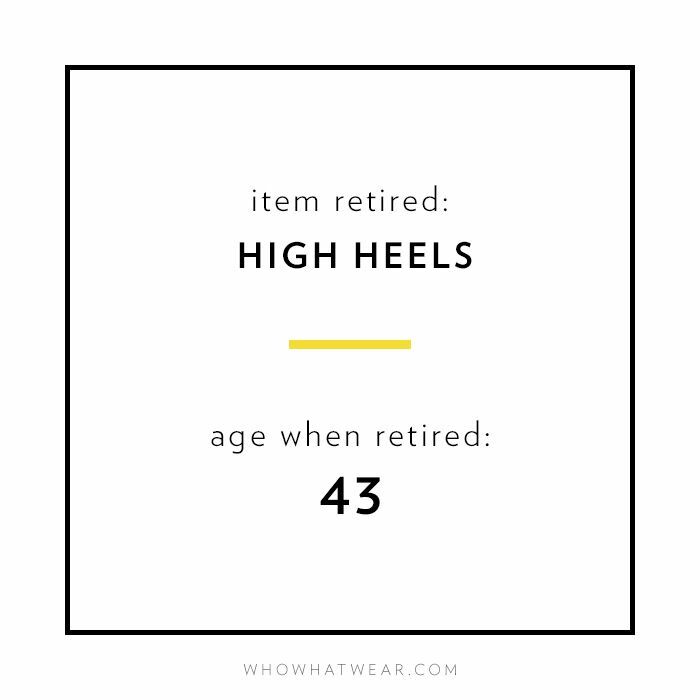 "I remember retiring high heels when my feet and legs were killing me after running around at work all day after I had kids." "I quit wearing bell-bottom jeans back when they were originally in style. I'm not tall, and they made my legs look stout." "I retired the really short skirt only this year at the age of 55, when I realised that while my legs still look 27, I am way too old to wear something that short." "Although I don't feel 62, I think that older women look better with a longer-length skirt, just above the knee. When I was growing up, the miniskirt was a very popular style, definitely for the young, and even today I feel that it remains true. Length is also about proportion, so it is important to find the right length for you to look elegant, but not dowdy." "I retired minidresses at 50." "You know the ones: those dressy, usually embellished tops you'd wear to dress up a pair of jeans or a miniskirt. They were college holdovers perfect for the post-college bar scene, but after a while they just felt too young. I wanted pieces with more structure and less bare skin, and definitely higher-quality fabric. But honestly, I kind of miss them! There was something wonderfully easy about the whole thing; just change your shirt and boom, you're dressed for the night. Maybe it's time for a grown-up version?" "Confession: I had a belly button piercing. I removed it senior year of college simply because as a freshman I judged the senior girls as too old for belly button rings, and I swore I'd remember my younger self's opinion when I reached that age. I was less open-minded back then. I have not replaced it—but I am considering more ear piercings." "I realised in my mid-50s I was more and more self-conscious and uncomfortable in sleeveless and spaghetti-strap dresses and shirts. Despite working out regularly, my arms just started to look 'old.' It isn't lack of muscle tone so much as skin texture; even with a tan or tons of moisturizer, there is just something unattractive about my arms these days. So if I put on anything sleeveless, I always wear a sweater or jacket over it." "Though I do make the occasional exception for a great shade of red, I stopped wearing bright nail polish at age 25. I've stuck to neutral shades ever since, and I consistently feel confident with my choice!" "I stopped wearing my door-knocker earrings at age 25. It was really a full head-to-toe look that I retired along with my Jordache jeans, Charles Jourdan gold stilettos, a very skimpy silk Marc by Marc Jacobs camisole, and rabbit fur jacket. I stopped frequenting the New York club and after-hours scene at that age and had no place to wear them anymore. I am 39 now and have saved the earrings, heels, and jeans because I just can't bear to part with them. They are part of my archives of many moments not to be forgotten." "I stopped wearing these because I felt it was the age-appropriate thing to do. Even though I have very thin and shapely legs, and could still to this day wear them, there is nothing I abhor more than a middle-aged women desperately trying to hold on to her youth. Sometimes it's just time to grow up!" "It's not that I don't want to wear them, but after having children in my late 20s and early 30s, I look flat as a board! Halters make me wish I had my 20s body back, to fill them out. But my three beautiful children are worth it." When did YOU retire certain fashion items from your closet? Tell us in the comments below!